This year marks the 50th anniversary of the International Motor Sports Association. Founded in 1969 by an ex-SCCA director John Bishop with funding from NASCAR impresario Bill France, Sr. IMSA’s first sanctioned race was for Formula Vee and Formula Ford open wheelers at Pocono Raceway. From that inauspicious beginning, the sanctioning body grew to encompass some of the most influential American motorsports events since. Between the IMSA GT championship, which spawned major manufacturer support and mega speeds in the 90s, to the American Le Mans Series which did the same across the 2000s, Bishop’s sanctioning body has been instrumental in the growth of American sports car racing. To celebrate IMSA’s 50th anniversary, many teams will enter the Daytona 24 Hour race next weekend with throwback liveries to significant cars from IMSA’s own past. Some teams have implemented these liveries better than others, but here are all of them to have been announced thus far. While Castrol is probably more associated with late 80s Jaguar GTP cars in IMSA history, the famed green/white/red livery was run on a GTO Mustang in the 1990s. The Motorcraft stripes adorned Roush-entered GTO Mustangs in the late 1980s. 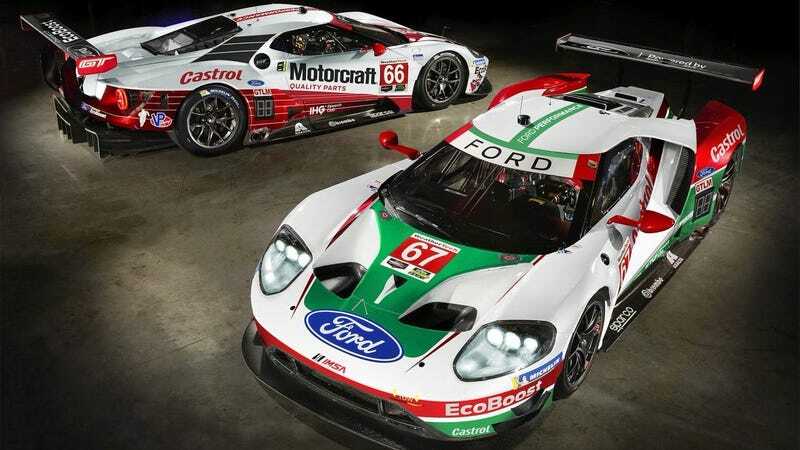 For me, the Motorcraft look works great, but the Castrol is a little bland. The Starworks squad is running a throwback to Audi’s IMSA GTO program with this somewhat predictable Audi 90 Quattro GTO livery. It’s cool to see these colors back, but the R8 will never be as cool as the fire-spitting Turbo-popping GTO car. CORE has moved from a successful LMP2 program in 2018 to an IMSA-specific Nissan DPi for 2019. In an effort to bring Nissan heritage back to the IMSA grid, they’re sporting a similar livery to the Nissan R91CP car that won the 1992 Daytona 24. Riley Technologies pro-am driver Ben Keating just happens to do frequent business with automotive chemical company Wynn’s. When leafing through vintage liveries to come up with a throwback livery for the 2019 season, Keating saw the Wynn’s-sponsored Porsche 962 of Hotchkis Racing. The team worked out a sponsor deal for the full season, so I’m hoping this totally rad livery sticks around all season. The gold wheels are a perfect addition. This is throwback done right. The red/orange and white livery of Acura is absolutely tied in to the history of modern motorsport. The colors are far more recognizable as those of World Challenge series champions RealTime Racing, which is not an IMSA-sanctioned series. Though Acura and Comptech did partner for the 1991 season in IMSA GTP Lights with a 3-liter V6-powered Spice chassis. That’s the livery the team are going for here, and it works well, if it is a little on the simple side. Sometimes simplicity works best.